The Sakıp Sabancı Museum has really outdone itself. Its current exhibition, a survey of the later part of the career of the Catalan artist Joan Miró, is a wonder. Although I personally don’t connect with a lot of Miró’s work, I can’t deny this is a great exhibition: intelligently laid out, cleverly lit and well supported with titbits of fascinating information about the man and his art. 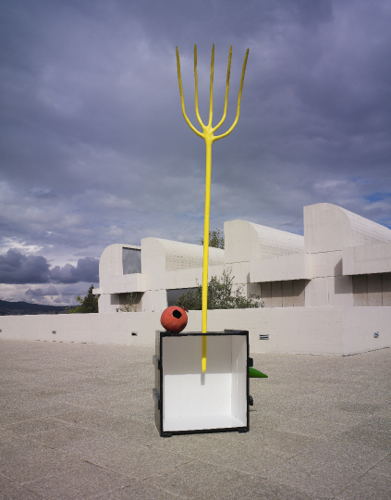 Staged in collaboration with the Joan Miró Foundation in Barcelona, the Successió Miró SL and the Pilar and Joan Miró Foundation in Mallorca, there are 125 works on display – oil and acrylic paintings, lithographs, etchings and his signature assemblage sculptures. 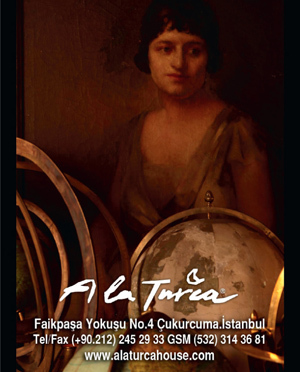 This exhibition is the last in a trilogy of shows paying tribute to the Spanish masters (following Picasso and Dalí). As the title tells us, the exhibition focuses on the themes of women, birds and stars, subjects Miró explored over many years in the later part of his career. The information on the wall tells us that this period of maturity is the stage of his life that the artist probably enjoyed most. The Second World War and the Spanish Civil War were over, he had financial security, and his friend the architect Josep Lluís Sert built him a studio in Palma de Mallorca, where he settled in 1956. 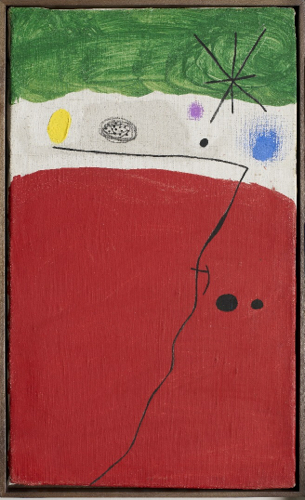 In the 25-odd years that he worked and lived in Mallorca until his death in 1983, Miró defined his style, restricted his themes, worked only with an elementary colour palette and concentrated on a specific imagery, the three mentioned above as well as the moon, sun and constellations. 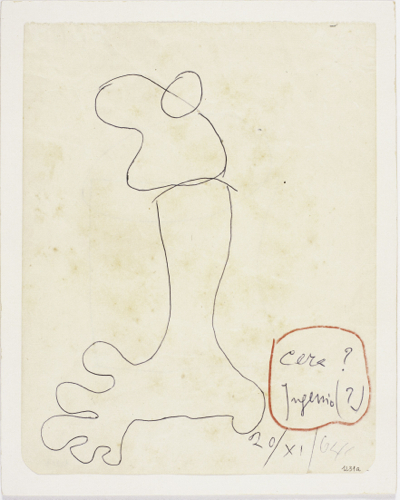 Ironically, it was this stricter path that allowed Miró to experiment more freely. During the 1940s, Miró developed a vocabulary of poetic signs which made an appearance in most of his later work. The works are concerned with cosmology: the sun, moon and stars appear among compact figures only partially completed and identified by eyes or hair. Other elements, such as black dots and lines, appear sporadically. There are also coloured dots, short brushstrokes, splashes and all kinds of gestural marks alluding to stars and constellations. 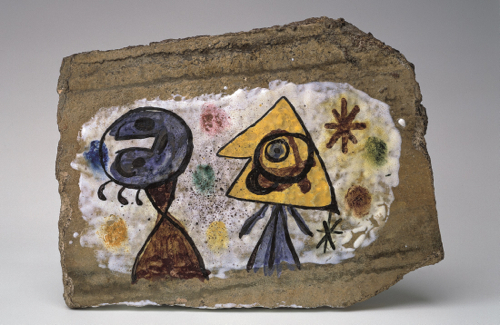 The above work from the mid-1940s, on which he collaborated with the ceramic artist Llorens Artigas, shows the genesis of his later style – the figures’ heads are reminiscent of a sun and moon, the coloured dots are present and the brushstrokes are heavy and short. 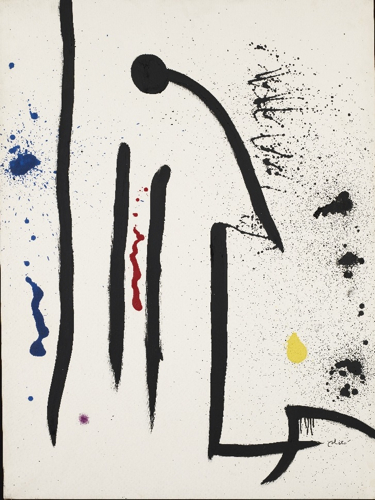 Miró's style – and especially the way he portrayed forms later in his career – did not arise suddenly; it was a slow process. After settling in his studio in Palma, Miró dedicated himself above all to etching, lithographs and ceramics. When he returned to painting in the early 1960s, his work was much freer and more expressive, with effects such as drips, handprints or splashes of colour spread over the canvas. He later applied these techniques to his sculptures and ceramics as well. 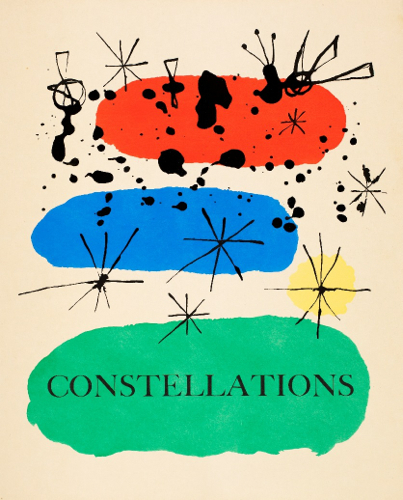 The above work shows the book Constellations, published in 1959. In terms of iconography, it showcases the most important pictorial signs of Miró’s language: colours are reduced and flat, backgrounds are lively, and figures are basic and stylised. 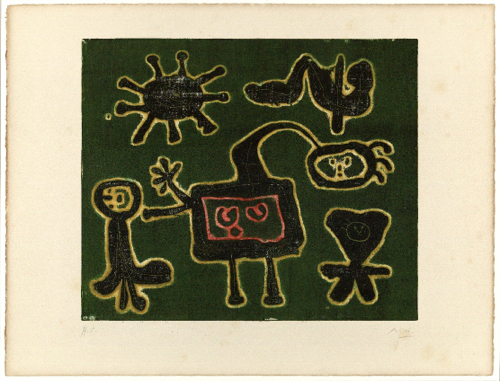 Throughout his career, Miró also produced many prints. 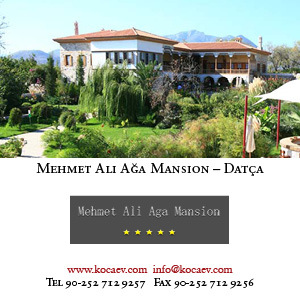 A number of his lithographs and etchings are displayed in the show. 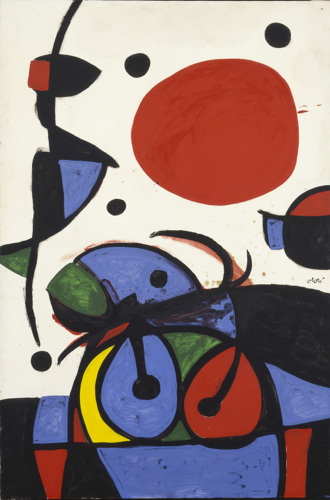 For both these mediums, Miró used original techniques. With his etchings, for example, instead of drawing on a stone slab, he engraved images on metal plates with a sharp tool. The plates were then covered with wax and an acid-resistant substance. Next the engraved sections were treated with a corrosive acid. Paper was then placed on the plate and the incised image transferred to it by painting. This allowed for a richer, more textured final product. 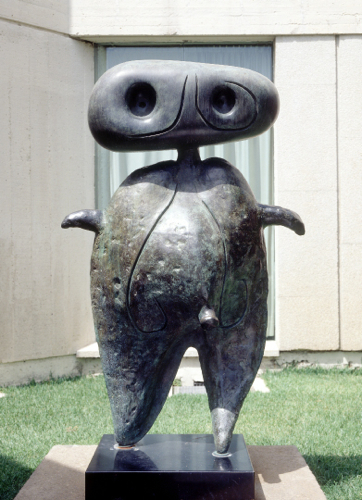 Miró’s ‘assemblage sculptures’ are made of found objects, which are combined and cast in bronze. The artist started making these in the 1960s. 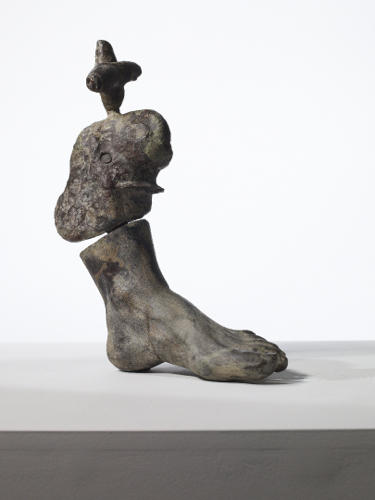 As the one above shows, once cast in bronze, the found objects lost not only their original function but also their individual colours and textures, becoming part of a more homogenous sculpture. 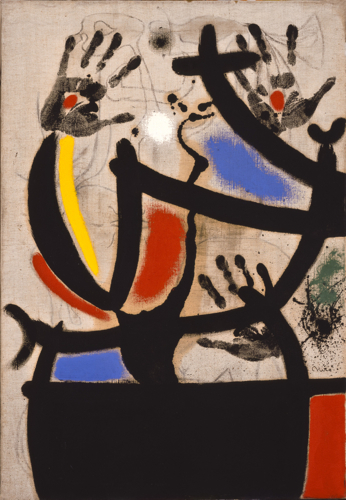 Towards the end of the 1960s, Miró introduced colour into his sculptures. The titles corresponded with those of his other work and referenced women, birds, stars, night, day or escape. The sculptures also used the same iconography seen in his pairings, though he substituted objects to parallel those signs. The work above shows a sculpture called ‘Woman and Bird’, with a yellow rake representing the woman. 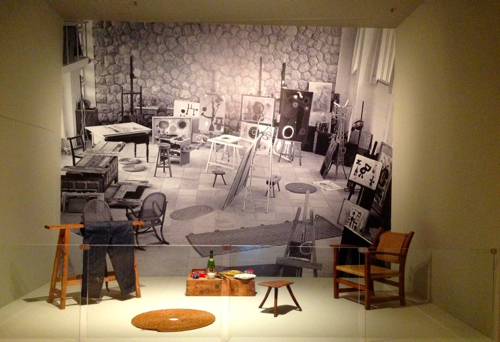 The exhibition not only traces Miró’s work, it also places great emphasis on his working quarters and processes. A recreation of his Son Boter studio can be seen above. After two of his murals were awarded the Guggenheim International Award in 1958, he was able to afford a building close to his Mallorca studio, which he also turned into a studio. The building, a two-storey farmhouse dating back to the 18th century, was named after the merchant Llorenç Boter. Miró felt very comfortable in this studio, which he set up meticulously, and this feeling of freedom spilled into his work. The Museum is now open until 10pm on Wednesdays and Fridays, so there’s no excuse to not visit this stunning show. It runs until March 8, 2015.